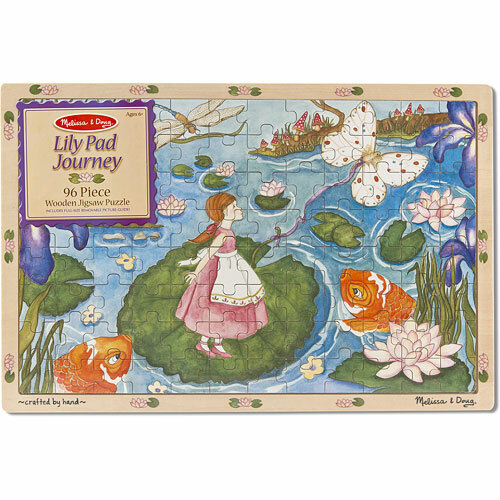 See Thumbelina travel through a rippling pond as this 96-piece wooden jigsaw puzzle is assembled on the puzzle board. 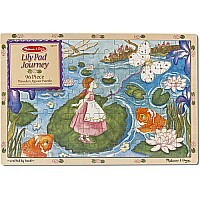 Pond lilies and irises bloom around the fairy-tale heroine and colorful koi attend as the lily-pad raft is pulled along, forming a charming scene that gets prettier with each correctly placed piece! When the puzzle is complete and the story is told, just put it all away in the sturdy wooden puzzle board for neat and easy storage. Measures approximately: 17.70 x 11.70 x 0.35 inches..